Jakarta, November 24, 2018 - Have you ever visited a museum? Nowadays, visiting a museum seems no longer interesting and it felt like an outdated activity. The museum is an institution that cares for and preserves collections of artifacts and other objects that have artistic, cultural, historical or scientific status. The existence of the Museum is important to be preserved to learn history and as an evidence of the richness of Indonesian culture. In order to introduce the diversity of Wastra culture or traditional Indonesian textile to the millennials, especially students of Visual Communication Design, Professional Association of Visual Communication Design Indonesia (AIDIA) held "AIDIA Creativ Course: Express Your Souvenir Design Work with Jakarta Textile Museum". AIDIA together with Indonesia Museum Association of Jakarta area, collaborating with Astragraphia Document Solution and Digital Sarana Infomedia to organize this creative event. Resita Kuntjoro, as a Deputy of Education and Training of AIDIA, said that she deeply understands the importance of Textile Museum existence as one of cultural heritage building as well as a window of Indonesian Wastra culture. The richness of Wastra culture or traditional Indonesian textile needs to be socialized to millennials, especially students, that visiting the museum is very fun and inspiring. 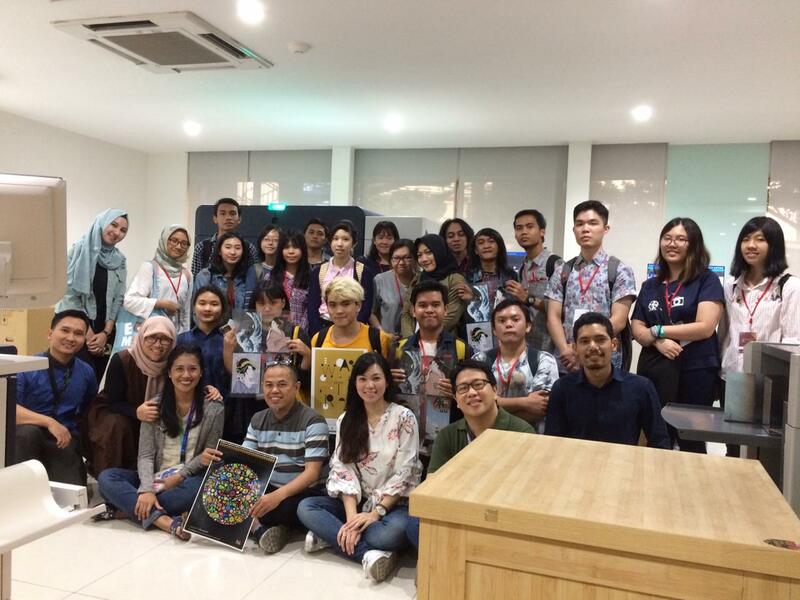 "AIDIA Creativ Course" was held from Saturday, 24 November 2018 located in two places, in Textile Museum Jakarta and Astragraphia Document Solution Technology Center (DSTC) for brainstorming sessions and discussion with the instructors. AIDIA Creativ Course workshop conducted to provide material about Indonesian Wastra textile and Digital Printing technology that currently developing. After the participants passed the workshop and sharing knowledge above, they will do a print test by applying Special Color from the Fuji Xerox Iridesse Production Press machine. The participants were asked to be able to explore Special Color from the Iridesse Production Press machine and use various paper materials, such as sticker paper, magnetism, mica, etc. Then proceed with judging to get 5 winners. Fitri Yuliani, as Marketing Communications Dept. Head of Astragraphia Document Solution said that with the same mission at this event can provide an opportunity for the community of visual communication design students so that they can channel their ideas and creativity without limits (Beyond Imagination), not only using standard colors, such as Cyan, Magenta, Yellow, and Black (CYMK), but also use special colors like Gold, Silver, White, and Clear on Fuji Xerox Iridesse Production Press machines to convey the message and the beauty value of Wastra art in a more diverse visual form. Later, one of the best design results from 30 DKV students can be displayed at the Wastra Exhibition of National Archives at the Textile Museum Jakarta on December 4, 2018 - January 31, 2019. Nowadays, the younger generation is more familiar with foreign cartoon characters than characters in traditional folklore. Astragraphia strives to grow back children’s interest in Indonesian folklore.